Bulova is the hallmark of American watch companies. The name itself resonates with quality, affordability, and history. All icons must start somewhere. Bulova's story began with a dose of the American dream. Twenty-three year old Czech immigrant Joseph Bulova established a jewelry shop in New York City in 1875. By 1911 he branched out into table clocks and pocket watches. A year later he opened the first Bulova watch factory in Switzerland. Always mindful of opportunity, he met the demand for wristwatches during World War I with a full men's line. Bulova entered the war effort during World War II by offering watches, time pieces, and other instruments to the United States government at cost. After the war, The Joseph Bulova School of Watchmaking helped retrain disabled veterans. Bulova was first with radio spot commercials and first with television commercials. In 1955, Neilson ratings revealed that the Bulova Watch Company's television commercials were the most viewed commercials world wide. Bulova introduced the first alarm watch, invented a photo timer that keyed off a racing starter's pistol, and an Accutron that was used by Nasa in the computers for the space program. Bulova's rich heritage and history of innovations continues to this day with the current ladies' and gentlemen's lines. Both lines display elegant design and craftsmanship with a variety of color and style choices. Case offerings come in silver tone, gold tone, rose tone, two tone, and black colored steel. Dials come in choices of black, champagne, silver and white. Bands are leather, metal bracelet, plastic, and fabric. Bulova offers water resistance in choices of splash resistant, swim proof, and diving standard. Bulova goes where you go. 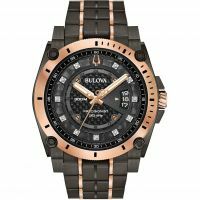 Bulova watches are high end time pieces without luxury price tags. Although they shun fine gold and silver, many styles come with special appointments more commonly seen in the higher price ranges. Cases shapes are round, rectangular, or the slightly rounded tonneau. The entire range is analog, leaving the less elegant digital display behind. Movements can be quartz or automatic wind. Bulova gentlemen's line of time pieces blends durability with fashionable appointment and clever detailing. Designs sport traditional solid face or recently popular exposed mechanism styling. 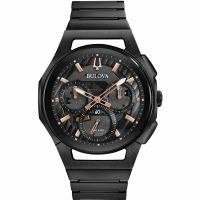 The entire Bulova gentleman's line is suitable for every situation, from formal dinners to vacation sports. The gentlemen's line also comes with titanium bands, and blue, brown, cream and grey faces. The Bulova ladies' line ranges from the ruggedly handsome to the elegant with a core of strength. 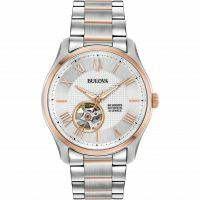 The ladies' line is crafted like fine jewelry, with feminine touches that define ladies' Bulova, including diamond chips which are almost unheard of at this price range. The ladies' line also comes with a ceramic style band and multi colored or mother of pearl face options.